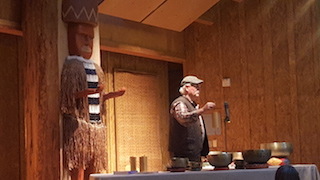 Sarah Nash, the new TLS Energykeepers Chair and a Pacific Northwest native, knew whom to call to kick the Gathering off to a ringing start - the vibrational ringing of Tibetan bowls produced by Ron Myhre, woodworker, artist, and sound healer from Port Townsend, WA. “This vibration that they put out is a healing vibration for all living things,” Myhre says. “Vibration is the whole essence. The whole universe vibrates. We respond to these vibrations,” he says. 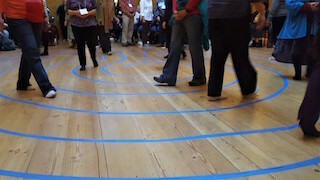 Ron walked around the room with one of his large bowls, treating participants to short, personal, head to toe, sound baths and then participants could walk the labyrinth. A great way to get centered for the weekend! The start of the Closing Ceremony was a bit disorganized because Sarah was at first unable to find her key helper, Lynda Tourloukis! Sarah was impressed with Lynda's Paperclip Peace Labyrinth initiative and wanted everyone to participate as a closing ritual on Lisa Moriarty's tape labyrinth in the Great Hall. It all came together with the appearance of Lynda with paperclips in hand, the ritual commenced, all walked, each holding a paperclip with thoughts of peace in mind, and finally the paperclips were joined together as a single strand that will be made into a labyrinth dedicated to world peace. As walkers gave up their paperclips, they joined in a double procession through the labyrinth again, this time singing the familiar "Dear Friend" song from past Gatherings.